Carpworld: How did you get involved in DT? Tom McGregor: Having worked in many parts of the industry over the years – manufacturing, retail, as a bailiff and then, latterly, in DT for two years – so it was a golden opportunity when DT came up for sale. Because of that it wasn’t too much of a change from what I’d been doing before as I was always involved in the angling world, and moving from working in the company, to running the company was just another day. CW: Have you made any changes since you took over? TM: Well, one thing will never change and that’s the quality of the bait... this has built the company’s reputation for 30 years, and was a major reason for me getting involved with it – and people who know me, know how proud of it I am. We’ve also improved customer service, with next day delivery and fresh-rolled bait being available to anglers for collection on a daily basis. And we always carry a full stock of related products. Beyond that, the factory is now something to be proud of too. It’s better laid out and, as a result, a better environment to work in for me and the guys. And me being me, it’s immaculate! CW: What does a ‘normal’ week now entail for you guys? TM: There are few weekends that we aren’t working, particularly at this time of year. We get a lot of email enquiries from anglers seeking advice and there’s always stuff to do in the factory. The most important thing at the start of the week is to get the weekend’s orders out to the anglers straight away! Then it’s about setting the plan for bait production on Monday and through the week, and then getting on with it! I’m lucky enough to have a couple of good guys in the office, who usually take orders and order materials, but sometimes if they have enquiries from anglers who want to talk to me on a particular query or bait choice, I’m only too happy to help. Then every week I find time for continuous development and improvement. For example, there are some cracking pop-ups in the pipeline and these will go out to the team shortly. 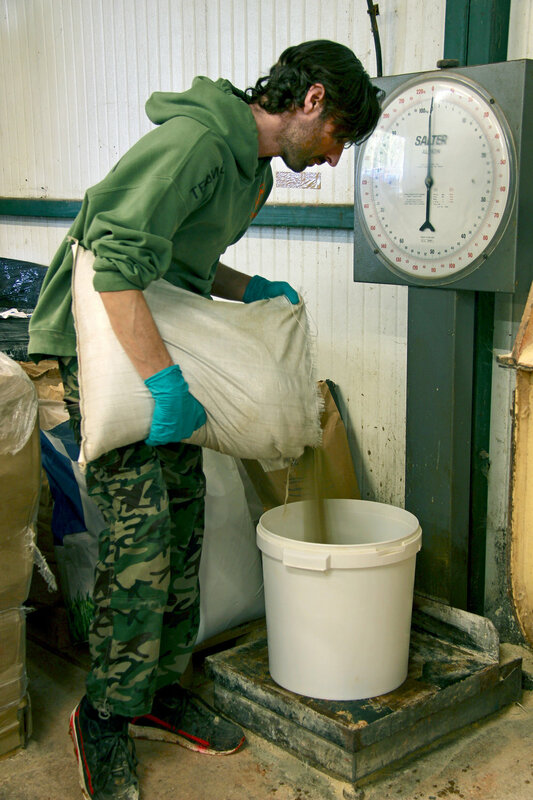 CW: What percentage of your sales are fishmeal-based, as opposed to birdfood or milk-protein these days? TM: Overall it’s about 50%, but it depends on time of year. In the winter we have to single out our best performing cool-water bait, Cold Water Green Beast. It’s the only choice of our customers in the colder months, and sometimes the choice of other company’s customers too! However, we have some phenomenal fish-based baits through the warmer months such as Pukka Fish and Berry Bubble and let’s not forget the N-Blend – that’s in a class of its own amongst nut-based baits, with the highest tiger nut content out there and is another top seller. CW: How are you, as a company, coping with the increases in cost, at source, of many key ingredients since the turn of the year? Will they have any knock-on effect with regard to the consistency of your product? TM: Yes, there have been cost increases in raw materials but we haven’t passed them on to our customers. It goes against our ethos to compromise standards. We buy the best ingredients, end of... and will always do so. For new baits we are constantly searching for fresh, interesting ingredients from around the world, yet we do have an eye on sustainability. As a company we are proud, for example, of not using glass spheres in pop-ups. As a side-note we are a carbon-neutral factory with electricity provided by solar panels around the site. In the world of carp fishing I think we have to take a sustainable view – it’s important. CW: If you had to choose one bait from your range, which would it be and why? TM: Wow, that’s a difficult one! We have got a bait for every season, and every situation... However, having had a particularly memorable season on one lake catching a number of fish including six 30lb-plus commons and my own English PB common of 47lbs 10oz, I would have to choose the Pukka Fish, Peach and Sour Cream. CW: Are there any new and exciting ideas on the horizon? Where do you see the company in another three to five years time? TM: We’re working on a new, blended liquid food and feeding trigger that we are really excited about. And we’re always working on ideas, but we won’t innovate for the sake of it – only if we can do something better. Our new bait sprays are a case in point... purer, more potent and effective than any on the market. Five years time? Although our customer base is growing in the UK and Europe – and I’ve got to look after that business – you’ll never drag me away from the bench where I’m researching, improving and discovering. That’s what gives me a buzz, after all the clue is in our name, DT Bait Developments – we have to keep moving, keep improving.